Do you savor the tender, golden crusts from your favorite pizzeria? My version is just as tasty and is surprisingly simple to make. Use it for all your homemade pizza recipes. RecipeSavants.com Do you savor the tender, golden crusts from your favorite pizzeria? My version is just as tasty and is surprisingly simple to make. Use it for all your homemade pizza recipes. Smart Recipes, European Recipes, Grains,Other Recipes, Recipes Grains,Other European Authentic Pizzeria Dough PT1H5M Serves 12 Ingredients: 1 Cup Warm Water 2 Tablespoons Rapid Rise Yeast 3.5 Cups Bread Flour 0.5 Teaspoon Sea Salt 1.5 Tablespoons Honey 0.33 Cup Olive Oil 0.25 Cup Corn Meal Preheat oven to 200 degrees. In a small bowl, add water and sprinkle yeast on top and do not stir. Set aside, and allow the yeast to bloom. In the bowl of a food processor, comine the flour and salt. While these process, slowly drizzle in oil, then honey and finally the yeast mixture. 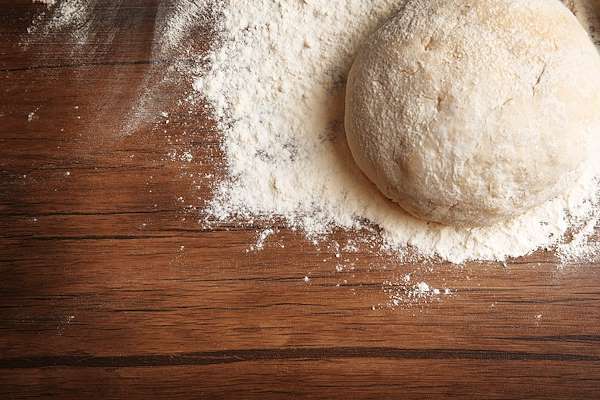 Process until mixture forms a soft dough ball. In a large bowl, coat the inside with a light layer of cooking spray and add the dough ball. Cover the bowl with a damp kitchen cloth and place in the oven until the dough doubles in size, about 10 minutes. Remove the bowl, punch down the dough, cover and return to the oven for a second rising, about 30 minutes. Divide dough into two even pieces and form them into dough balls. If the pizza recipe only requires one crust, coat the other dough ball lightly with cooking spray and place in a large resealable bag. Press out as much air as possible and seal the bag. Freeze for up to 3 months. To thaw, place bag in the refrigerator for at least 12 hours, or overnight.